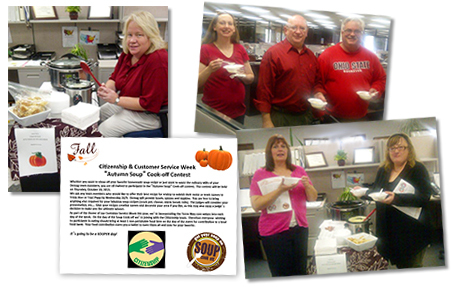 Every year, we ask the Customer Service Week community to share celebration highlights. For the team at Health Business Systems, the Penny Wars were enjoyed by all. You may remember Penny Wars from your school days or your children’s. Incorporating this fun, competitive fundraiser into a Customer Service Week celebration makes a lot of sense. 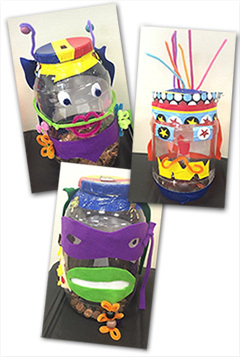 To begin, divide the service group into teams and have each team decorate their own collection jar. Now, the competition begins. On Tuesday and Wednesday each team member brought in all their pennies and placed them in their team’s decorated jug. On Thursday morning all pennies were removed from the jars and counted. The total number of pennies was not revealed at this time. On Thursday and Friday the team members put all their silver coins in the opposing team’s jugs. Each quarter placed in the other team’s jug would decrease that team’s total by 25 pennies, each dime, 10 pennies, and so on. This was an exciting and very competitive competition. Team members were raiding their coin jars and going to the bank to exchange dollars for pennies and silver coins to ensure their team was the winning team. The winning team snuck by the second place team by $6.00 and was declared the winner. At the end of the week, a total of $1,040 had been collected. As an alternative, consider emptying and counting the containers daily, then posting the cumulative results to keep the competition lively. Charitable activities were also seen in a clothing drive, canned food drive, and CanStruction activity. Last year’s Customer Service Week theme was, "Everyday Heroes." And we were proud and honored to have several groups of military heroes celebrating the week. In Fort Bragg, NC, fifteen sections in the United States Army Installation Management Command participated. IMCOM brings a strong service approach to its work managing the day-to-day operations of army installations around the globe. 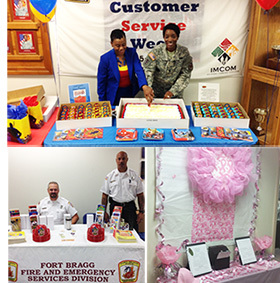 The celebration began with a speech from Command Sargent Major Tate after which everyone read the Customer Service Week pledge, cake was shared with all, and gifts were presented to soldiers being recognized that day. One of the many highlights of the week took place on Thursday, which was set aside as Awareness Day. Each of the participating sections selected a cause to champion. Team members created educational displays and manned them throughout the day, providing valuable information to all. During Customer Service Week 2014, the Health Plan of San Mateo collected and donated 21 bags of clothing to a local organization, which desperately needed to restock its clothes closet. Its a wonderful activity that you can use any time of year to boost morale while doing good. As you can see from the photos, the outfits were creative and colorful and the audience enjoyed them all. Charitable activities were also seen in penny wars, a canned food drive, and CanStruction activity. When the team at United Stationers Supply Company began planning for Customer Service Week last year, they included some of their favorite things from past celebrations along with a few new ideas. The most popular says Raechal Schneider was the Pay it Forward Campaign. Each day of the week had a different theme and activities including a 50s day, relaxation day, and formal wear day. On Tuesday associates dressed down in t-shirts supporting their favorite causes and throughout the week they brought in donations for three different groups. Food and personal hygiene products for a local food pantry to supply over 50 families. 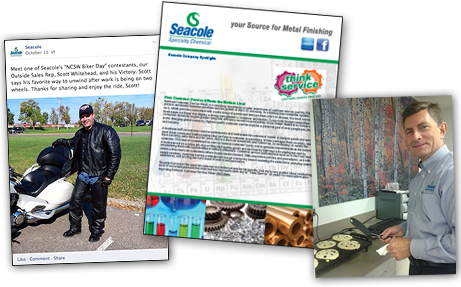 Seacole, is just as interested in customer service as it is in chemical manufacturing and distribution. So this year it joined the growing list of organizations celebrating Customer Service Week. From the Kick-Off Breakfast on Monday morning to the Wrap-Up Pot Luck on Friday afternoon, it was a week full of activities. Organizer Laura Engelby, took advantage of the companys Facebook page, Linkedin page, and e-newsletter to build excitement for the upcoming event and share details of each days activities with coworkers and customers. For example Outside Sales Rep, Scott Whitehead is featured on Facebook as part of the Biker Day event. Gregg Elliott is shown on the companys Linkedin page making his famous pancakes. And the companys service philosophy is discussed in an e-newsletter in an article titled, How Customer Service Affects the Bottom Line. The week was such a success that Seacole is planning a second celebration in 2014. To prepare, all participants were invited to complete a brief questionnaire. Click here to see the survey and newsletter article. Demag, A Terex Brand held an Autumn Soup Cook-Off — a perfect team-building event for cool-weather areas. Individuals and groups were invited to prepare their favorite homemade soup for the event. The company provided bowls, spoons, and napkins, and asked the chefs to provide any extras such as bread or rolls. The criteria for winning included not just the soup, but a creative soup name and presentation. Anyone could enjoy the festive luncheon and cast a vote for their favorite soup. The only requirement was the donation of a non-perishable food item for a local food bank. This low-cost event brings the company together, supports the community, and nourishes body and soul. Demag, A Terex Brand has celebrated Customer Service Week since 2001 and every year we feature their activities, which combine successful elements from the past with new additions. 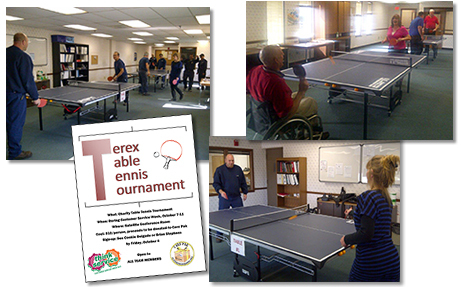 One new event this year was the Terex Table Tennis Tournament. This fun, teambuilding event also had a second purpose. It raised funds for SupportOurTroops.org, which provides care packages to troops overseas. All employees were encouraged to participate and funds were raised through a $10 entry fee. Senior management agreed to match all fees, so the group was able to donate $820 to this worthy cause. The team at The Results Company wanted to give back to their community during Customer Service Week. So each of seven locations selected a teambuilding charitable activity. Below are all seven activities. There just may be an idea to inspire your team. Results Stuart held a Pumpkin decorating contest with all pumpkins being donated to the Blue Ridge Nursing Center. They held a 50/50 drawing and raised $150 for the Cancer Society. They also began a coat and canned food drive with all contributions donated to local food banks and the Salvation Army. Results Streator focused their efforts on the Saving Sidney cause. Sidney is a 5-year old girl diagnosed with achalasia. At a benefit event, the team presented Sidney with $710. Results Eastwood adopted the MyShelter Foundation and their Liter of Light initiative. The Foundation is dedicated to bringing eco-friendly bottle lights to communities without electricity. Team members donated 150 empty bottles as well as liquid bleach, sealants and other materials needed for the project. 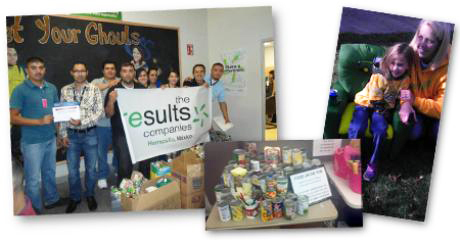 As part of a site-wide team competition, Results Hermosillo collected 1,088 food items and donated them to the Banco de Aliminentos. Results Galax donated $950 to the Twin County Humane Society. Blankets, towels, food, a dog house, and other items were also collected by staff and donated. Results Provo held team competitions in an effort to collect nonperishable food items for the Utah Food Bank. Agents also participated in a bike build off in support of the Utah Foster Care Foundation. Through various activities including raffles, Supervisor Dials, Pie your Manager and a car wash, Results Winter Haven raised $375 for the Polk County Education Foundation. The foundation assists Winter Haven-area teachers by providing tools and supplies. After a full week of activities at Nufarm Americas, the celebration continued into the end of the month. The week included a host of activities created to provide opportunities to recognize coworkers, get to know teammates, and involve families. The service team also wanted to reach out to the community, so they ended the week with an ice cream social and canned food drive. Several weeks later, volunteers from the service team continued their good work by helping package meals to be distributed to local families. To involve their own families, the team hosted a poster contest. Drawing on the 2012 Customer Service Week theme, Be the OneTM, teammembers asked their children, grandchildren, nieces and nephews to illustrate one of the following themes. Prizes were awarded in two age categories: 5-7 and 8-12. The contest sparked a lot of creativity, started conversations about what mom and dad are doing all day, and provided festive decorations for the service department. Pauline says that shes already planning for next years celebration. 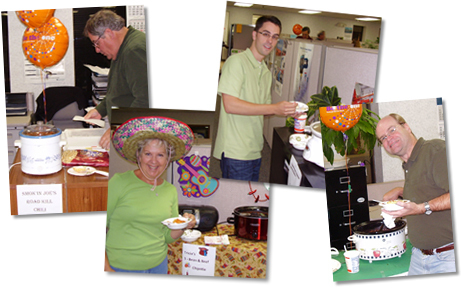 The Friday chili cook-off at Demag — A Terex Brand, was a company-wide team-building event. Each participant brought in a crock pot with their entry and set up a tasting area in their own department. Each tasting area was unique and encouraged people to travel through the office visiting other departments. In order to enjoy this special lunch and to cast a vote for the best entry, employees were asked to bring in canned goods for a local food pantry. Customer Service and Spare Parts Manager, Tricia Ater, notes that she was overwhelmed by the generosity and saw many people bringing in bags full of food. Charitable activities were also seen in penny wars, a clothing drive, and CanStruction activity. 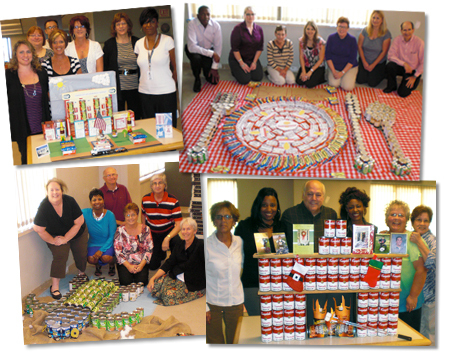 An amazing construction activity at Kansas City Life Insurance combines teambuilding and community service. This year the service team participated in a CanStruction event. During these events, sculptures are created entirely from canned goods, which are then donated to local food banks. For Kansas City Life, the rules were simple and the results were extraordinary. Above are photos of the teams work which include a sculpture titled Be the One to Stop Hunger, a replica of the companys office building, a sea turtle, and a cozy fireplace. CanStruction is a design/build competition showcasing the talents of design and construction of our Customer Service and Claims professionals. Teams are given a total of 1 hour 30 minutes to defy expectations, logic and gravity as they build fantastic sculptures from cans of food and other non-perishable items. During the Monday AM meeting we will divide you up into 4 teams. Each team will be assigned a 30 minute time slot on Monday to meet as a group to assign a contractor and develop a blueprint for your artwork. The construction of your design will take place on the 5th floor and each team will be provided with a 5 x 5 space for building and a sheet to cover your work in progress (NO SPYING!!!). You may not deface the food items or packaging in any way as they will be donated. Your contractor will then be charged with bargaining with the contractors from the other 3 teams for the canned goods and non-perishable items already donated to determine what might be needed for your creation. You may also donate additional canned goods and perishable items throughout the week to compliment your design. Tuesday through Friday each team will be assigned a 15 minute time slot to work on their project. You will need to consider whether your 15 minutes should be as a team, broken up into smaller groups or on an individual basis. All construction must be completed by 12pm on Friday. Judging will take place around 2:30ish. Winning Team will be awarded prizes. Although, everyone is a winner because all canned goods and non-perishable items will be donated to a food pantry to help feed those less fortunate. Charitable activities were also seen in penny wars, a clothing drive, and canned food drive. While Customer Service Week, and our team, are headquartered in the United States, the event is celebrated around the globe. 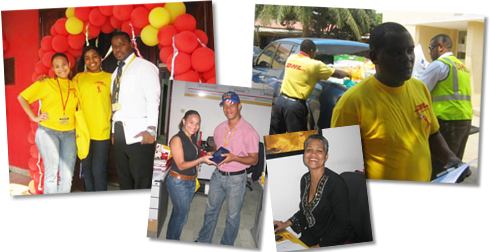 This week we have highlights from a celebration in central Africa which involved the entire staff of DHL Angola. The very first day, marked this as a special celebration. The service team kicked off the week on Monday. Rather than dress in company colors or Customer Service Week colors, staff were asked to wear the colors of the rainbow.The objective was to celebrate and acknowledge the many different backgrounds of people on the DHL team as well as in the 250 countries they serve. On Tuesday, the goal was to celebrate the community in which DHL works. Staff donations were used to purchase enough groceries to fill a pickup truck. The truck then headed off to a local hospital to make the much needed delivery. Daily activities continued throughout the week, including celebrations at retail locations, which featured snacks, happy hours and games. Many organizations involve their external customers in their Customer Service Week activities. After all, its the perfect time to thank customers for their business and to demonstrate your organizations commitment to customer satisfaction. Two organizations found creative ways to involve and thank their customers. The team at Sperian held a t-shirt swap in which Sperian reps and their customers exchanged t-shirts. Heres how it worked. For several weeks leading up to Customer Service Week, key customers were asked to provide one or more of their logo t-shirts. 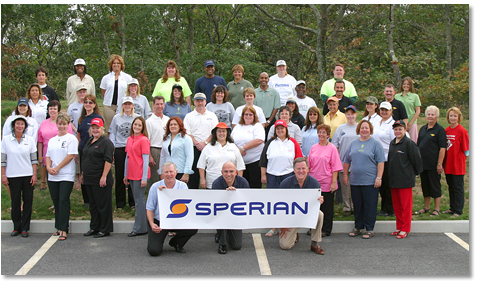 In exchange, Sperian provided an equal number of their logo t-shirts along with some special treats and a photo of the service team wearing their customers shirts. The activity was a huge success and a great way for reps and customers to show theyre all on the same team. Meanwhile, folks at The Cincinnati Insurance Companies were also involving their customers in their celebration. During Customer Service Week, every fifth caller to the help desk received a coffee mug along with a card signed by the analyst who had handled his or her call. Many firms and organizations honor individual frontline reps during Customer Service Week. One popular way to do this is with peer-to-peer awards. Another method, which is gaining popularity, is to ask customers to recognize employees they feel provide exceptional service. 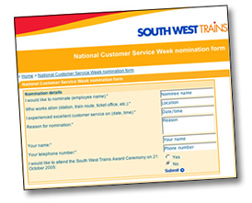 To celebrate Customer Service Week, South West Trains, which provides train service to the southwest of London, asked passengers to nominate a member of the staff who had made their travelling experience more enjoyable. In all, over 1,000 customers sent in paper forms or went online to nominate almost 250 individual employees. Of these, 17 employees were selected to participate in an awards ceremony at which they met one of their nominators in person. An overall winner was also announced at the ceremony. The team at Osram Sylvanias Automotive Lighting Division used the week to strengthen their connection to their external customers. Prior to Customer Service Week an email was sent to key customers describing Customer Service Week and requesting a customer photograph. The photos were then displayed and reps were asked to match customer names with their photos. The rep with the most correct answers was the winner. As customer service rep Tracey Guild explained, it helped the team feel that they had truly built a bridge to customers by making the relationship more personal and placing a face with a name. To further build the connection, the team sent a photo of themselves to their customers. This is the kind of creative use of the Customer Service Week theme that makes each celebration unique and meaningful.